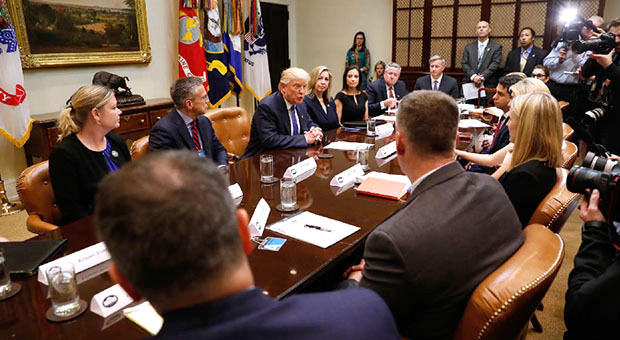 In an impromptu update from Corey Goode on his YouTube channel Goode Vlog, Corey gives brief commentary on a round table discussion lead by President Trump on the rampant problem of human trafficking. This is a problem which stretches not only across the U.S., but around the world as well. This public revelation is a very interesting development for a number of reasons, and comes at a particularly interesting time. The issue of human trafficking and the massive ongoing efforts to end these crimes are subjects that the corporate media has actively ignored since these efforts first began in early 2017. It seems that around the clock, hundreds of arrests and high-profile busts are taking place headed by special task forces specifically targeting human traffickers. Yet the media remains intent upon avoiding this issue altogether. Despite the media's efforts to avoid this issue, these much-needed changes are continually taking place. With this recent development and public announcement by President Trump, it appears that the ignorance of corporate news sources can no longer stand. It is good to see this positive development within the Trump presidency. On a backdrop of apparently questionable and irresponsible decisions on the part of Trump, this seems to be one issue that he has on straight. In case anyone is still wondering, this is public admission of the issues surrounding the infamous Pedogate/Pizzagate. This is the disease of pedophilia which has spread across both parties and in multiple offices of government and the corporate world. Though it is not openly stated in CNN's coverage of the topic, the issues surrounding Pedogate are most likely a very significant topic of the discussion. To see the overt media bias toward the admittedly questionable president is also concerning. It is as though these corporate news sources are only interested in attacking Trump and portraying him as worthless as opposed to communicating a fair and thorough message. Granted the man has many flaws and his recent actions have concerned many responsible citizens (to restate). However, just as any human being, he does have his strong suits. One of the major reasons Trump was elected was his intent to deal with corruption wherever it may be within the U.S. government. Though there is still significant progress to be made on this front, one cannot deny the likelihood of positive and numerous forthcoming results. According to Corey Goode, this is a somewhat faster pace than some may have expected these events to take place. This is an extremely significant and public development in comparison to the subtle and covert operations that have been taking place thus far. It could be that the positive Earth Alliance has observed the quickening pace of operations, as well as the partial disclosures of the globalist Cabal. It may be that due to this increased pace, the Alliance sees it necessary to beat the Cabal to the punch and take their network of human trafficking down. As the satanic nature of the Cabal is exposed to the world, this may defeat any ability this Cabal has of saving their image. Afterward, they might be left in the spotlight of justice without any more face-saving scams left to redeem them. This is the hope of many of us, and it is up to each of us not simply to sit on the sidelines, but to educate ourselves beyond the catered script of corporate media (which is actually and provably owned by globalists), and to act responsibly to ensure justice, fairness and freedom for all peoples of the world.